Obituary for George Louis McNary Sr.
George Louis McNary Sr, 88, passed away peacefully, October 12, 2018, surrounded by his loving family. Family and friends will gather for visitation for George from 9:00AM to 11:00AM, Saturday, October 20th at First Baptist Church, 301 N. Glass in Victoria. The Homegoing Celebration for George will follow at 11:00AM with Reverend Fred Hobbs, Pastor of Mount Nebo Baptist Church, officiating. George will be laid to rest beside his beloved wife of over 63 years, Willie Mae Fryer McNary, at Memory Gardens Cemetery in Victoria. Repast will be held at First Baptist Church in the Fellowship Hall. George was born one of ten children to the late James Edward and Sarah Ann Edwards McNary on January 10, 1930 in the Edgar Community of DeWitt County, Texas. After graduating high school, George served his country in the United States Army during the Korean War and was a life member of VFW #4146. George married his love and sweetheart, Willie Mae Fryer, March 19, 1955 and they moved to Victoria. George was a faithful member of Mt. Nebo Baptist Church, where he joyfully served as a Trustee and in the Male Chorus. He worked for Victoria Ready Mix as a cement truck driver and later retired from The Fordyce Company, after 33 years. George was a dedicated and faithful 32nd Degree Mason, serving as a member of the Masonic Boaz Lodge # 261 AF & AM and United Most Worshipful Scottish Rite Grand Lodge AF & AM, of Texas, Inc. He served the lodges holding numerous positions, including Worshipful Master, District Deputy of #8 and #9, Grand Marshal Emeritus, and was elected King numerous years in a row. George enjoyed family gatherings, cattle, crossword puzzles, playing solitaire, fishing and catering BBQ. Grandpa will be fondly remembered for his easygoing spirit and sense of humor. His grandchildren and great-grandchildren brought him great joy. George was preceded in death by his loving wife, Willie Mae McNary, May 30th of this year. We know they are reunited and rejoicing in Heaven. George was also preceded in death by his parents, Ed and Sarah McNary; first grandson, Jason Randle, for whom he adored; eight siblings, Althea Green, Martha Hobbs, James McNary, Berniece Ellison, Marjorie Green, Emma McNary, Wallace McNary, and Ida Bell McNary. He leaves behind to cherish his wonderful memory of strength and faith, six devoted children, Jacqueline Randle and husband, Milton of La Marque, Texas; George McNary, Jr. and wife, Cecilia of Rosenberg, Texas; Althea Cyphers of Pflugerville, Texas; Gregory McNary, Sr. and wife, Primrose of Victoria, Texas; Ron McNary of Victoria, Texas; and Marilee Anderson and husband, Reginore of Houston, Texas; fifteen grandchildren, Milton Randle and wife Samantha, Jasline Randle, George L. McNary, III and wife, Natara, Joshua McNary, Gabrielle McNary, Blake Cyphers, Lathaniel Callis, Gregory McNary, II, Bergendi McNary, Darrell Bledsoe and wife, Tanisha, Robin McNary, Kaylin McNary, Jessica Edwards and husband, Clinton, Jillian Anderson, Jayce Anderson; thirteen great-grandchildren, Courtney, Deon, Colby, Dominique, Kayleb, Jaelen, Dhanti, Milton, Jr., Clinton, Jr., Dhavin, McKenzie, Giselle and Addison; his sister, Edolia Wade; one brother-in-law, Herman Fryer (Florence); four sister-in-laws, Allen Scott, Johnell Price, Dorothy Ross, and Nancy Brown (Everett), a host of other loving family members and friends. The family of George Louis McNary, would like to thank all the wonderful medical and support staff of Port Lavaca Nursing and Rehabilitation Center Generations Unit, most notably Mindy, Stephanie, and Jean. Special thanks to the Nurses and caregivers of Accolade Hospice. Condolences and memories can be shared at www.gracefuneralhome.net. Services are under the direction and personal care of Grace Funeral Home. 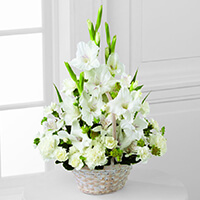 To send flowers to the family of George Louis McNary, Sr., please visit our Heartfelt Sympathies Store. To send flowers to the family of George Louis McNary Sr., please visit our Heartfelt Sympathies Store. We encourage you to share any memorable photos or stories about George. All tributes placed on and purchased through this memorial website will remain on in perpetuity for future generations. To George's family and friends, Please accept my condolences. Christ Jesus has resurrected people in the past (Luke 7:14) and there is a sure hope for us to be reunited with our faithful loved ones in the near future (Isaiah 24:8). Please take comfort in such hope. Wishing you peace to bring comfort, courage to face the days ahead and loving memories to forever hold in your heart. With Love From Your Liberty Property Trust Family ! My deepest thoughts & prayers goes out to the McNary Family. George was a real good man and so was Willie May. I always enjoyed the good times with the whole family growing up. All the BBQs that you dad use to throw out his house. George never turned anybody away. He had a big heart with one heck of a funny bone. I am so glad my dad Roy Davis who has always been a great friend of your dads introduced me to him. Once again my thoughts and prayers go out to the whole family and the heavens above will be definitely rejoicing. I can only imagine the family reunion/ BBQ they are having up there.